About at autoteile. We deliver OE and OEM Automotive spare parts. 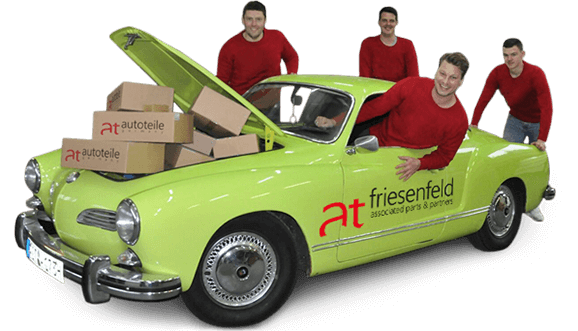 The company friesenfeld GmbH & Co. KG was founded by Andreas Friesen and Thomas Wingenfeld and delivers OE and OEM automotive spare parts of carefully selected manufacturers worldwide. Furthermore, we offer exclusive and special automotive products of our brand at autoteile germany. Together, we have more than 30-years essential experience in the automotive spare part sector. Additionally we have a worldwide network of contacts in this branch and are therefore able to react fast and flexible to our partners’ wishes and requirements. We realize our business objective, by communicating frequently with our suppliers and customers because only a close and long-term cooperation with our business partners leads to success. Furthermore, we are interested in long-term business relationships with our partners, which are beneficial for both sides. Therefore, our maxim is „associated parts und partners“. Become a business partner of the friesenfeld GmbH & Co. KG, convince yourself of our services and our high quality products and become a part of our young and dynamic company.